We have spent the winter applying for grants from different organizations. We were successful with Bow River Basin Council, but we need matching funds in order to be able to conduct a science-based watershed study. We are waiting to hear from Land Stewardship Centre and AlbertaEcotrust. Last Friday, May 19th, we erected our first sign to mark the reserve and municipal lands and the trail in the area. 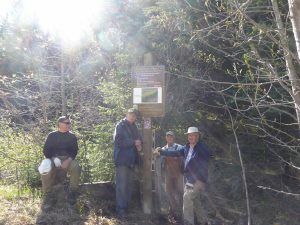 The erection of these signs was made possible thanks to our volunteers and to Cochrane Foundation who donated money for the purchase of our website, wildlife cameras and our famous signs. purpose: To teach municipalities and other stakeholders about the importance of privately owned riparian lands. To provide participants with emerging knowledge of best available science and policy tools to understand the functions, deleniate riparian building development setbacks, govern and manage these lands. BCPS is seeking comment on the need for an area conservation plan prior to more area urban expansion. Water is a major issue for this new development proposal (Urbanstar), just as it remains for the Glenbow Ranch development. We think that the city of Calgary is not planning on supplying Cochrane with additional water and has no plan to supply Glenbow, nor to take its sewage. A sewage treatment plant being toyed with the west side of the Glenbow development would not cover the whole development. Does RVC has a coherent long term plan for development, water supply, sewage or ecological aspects such as a wild life corridor? We would like to hear your thoughts on this matter. 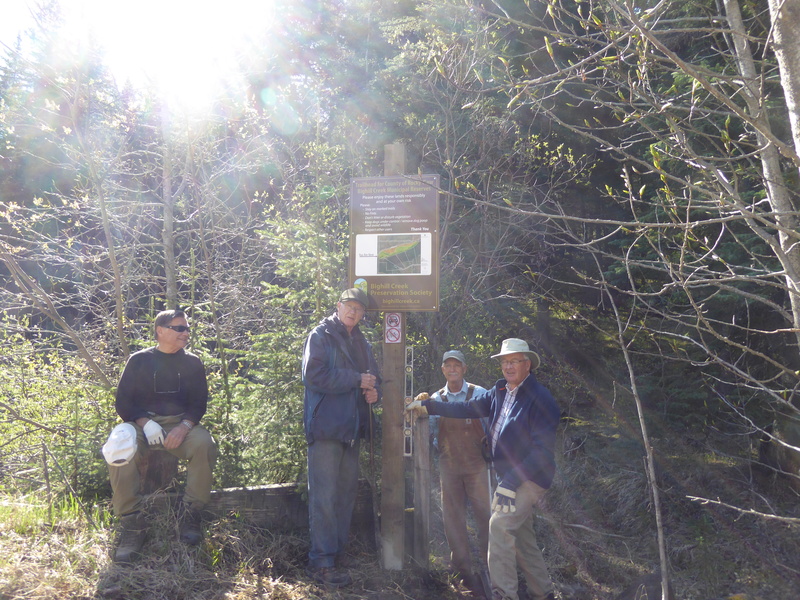 “The Urbanstar Glendale Land Development area is over a section of farm/ranch land located in the Bighill Creek drainage within a mile of the creek. BCPS encourages everyone who values the protection of the creek to attend the meeting to Identify any concerns and provide their comments. According to someone at the consulting co. supporting this development, this is a “Conceptual Plan” which is the starting point for an Area Structure plan. This person was unable to provide access to any maps or charts (There are some aerial photos on the Urbanstar website.) It seems that there had been no attempt to align/coordinate with the Glenbow ASP although she said Glenbow ASP is apparently planning to put a water treatment plant on the north side of 1A at RR35 ( Glendale/ Urbanstar land) with a supply line down to the river across Glenbow Park. Note- the meeting is this Thursday- the 22nd of September. The meeting will be held from 6pm to 9pm at Rockpointe Church. 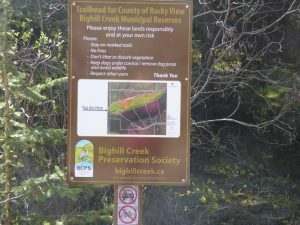 Bighill Creek Preservation Society is the steward of the Municipal Reserves located in the southern end of the Bighill Creek drainage. 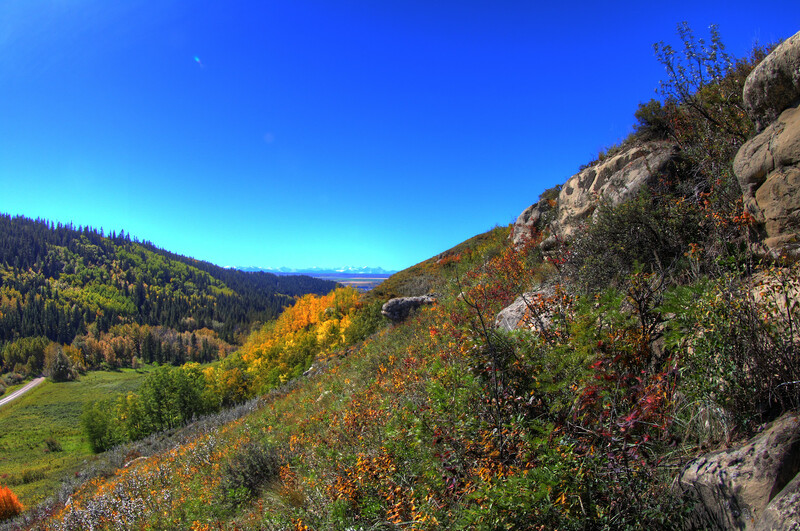 Located on these lands are natural trails which offer scenic views and opportunities for encounters with nature, and exercise and tranquility. 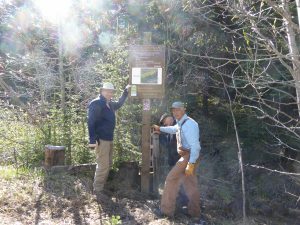 The primary trail starts at the right side of the second bridge on Big Hill Road. It generally follows the creek upstream on the south bank. 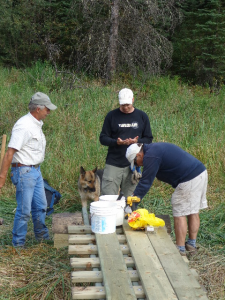 It is a pleasant half hour walk to the top of the Reserves however until recently, crossing the creek to return along the unused road allowance on the north side of the coulee necessitated fording the creek. 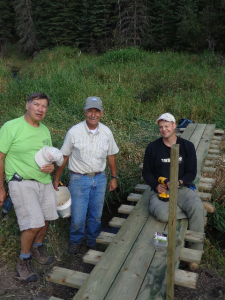 A footbridge constructed BCPS near the northern end of the Reserves now provides a dry crossing and the opportunity to enjoy this wonderful natural area from an entirely different perspective on the return leg. We’d like to thank BCPS volunteers who designed and constructed the bridge. 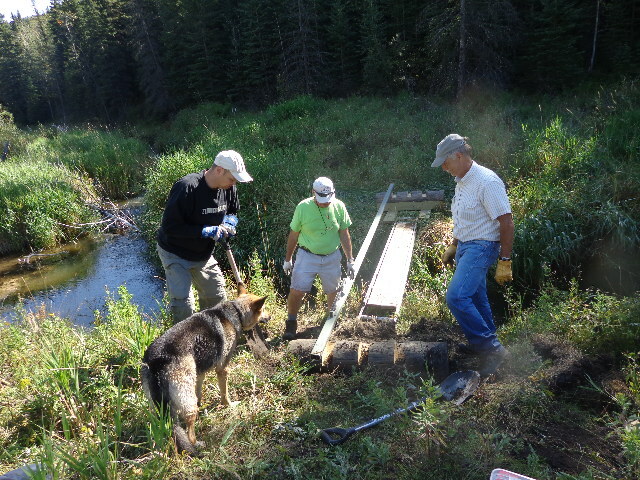 We greatly appreciate materials and financial support provided by Cochrane Foundation, Hunter Technologies, Moose Mountain Homes and Cochrane Home Hardware. 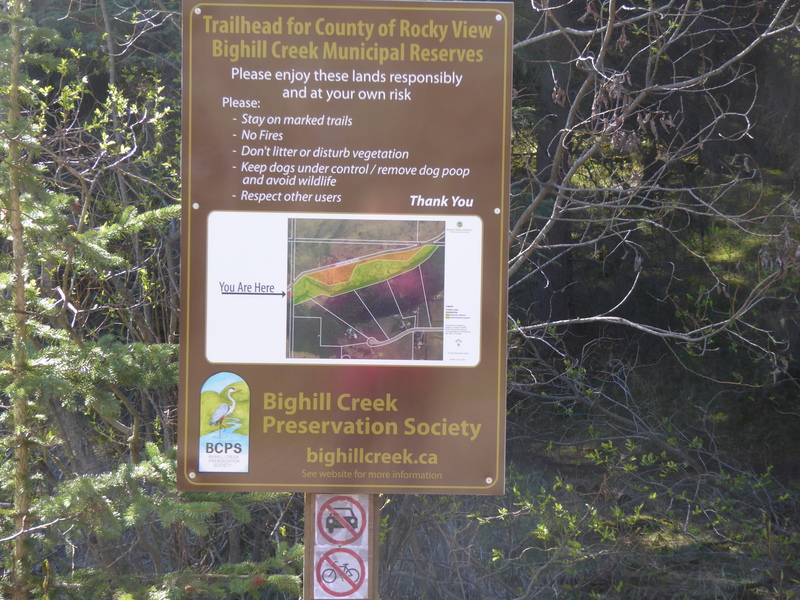 Please go to www.bighillcreek.ca for more information regarding BCPS and a Google Earth book mark for the location of the Bighill Creek Municipal Reserves. Please use these and enjoy all our natural areas responsibly. Take only pictures- leave only foot prints. $4 000 from Cochrane Foundation. 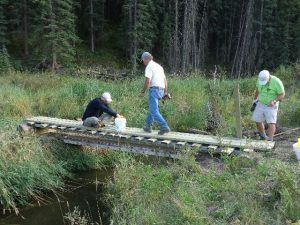 The bridge cost $1000 in building materials.